Peering from the second story window of her home near Hwy. 9 and Bathurst Street, Andrea Rennie watches a coyote play and hunt in the late morning or early afternoon. She has watched the animal since mid-December and although the it hasn't shown any odd or aggressive behaviour, she wants her neighbours to be aware of it since it often plays around a tobogganing hill near Glenway Golf and Country Club. "I know it is not going to attack unless it feels cornered," she said. "But people should ust know he's out there so they can take precautions." She has taught her four-year-old son, Benjamin, to flick the outdoor lights at night before letting the family cocker spaniel out in the fenced back yard. She has also been advised to bang pots and pans before venturing into the back yard to ensure the animal knows people are there. "If children don't know, they might think it's a dog and walk up to it," she said, noting she's also concerned about neighbourhood cats and dogs. She assumes the animal has been forced to leave its original home because of the development going on nearby, making wildlife seek other areas for food and shelter. "It's not uncommon to see them in the winter when there aren't many people out and about because of the cold," Gates Wildlife Control president Brad Gates said. "This is the time of year they would feel most comfortable in a populated area." Almost 99 per cent of the time, this type of animal would be more inclined to head the other way rather than create a conflict with a human, he added. However, small domestic animals can be seen as prey when food sources are at a minimum. 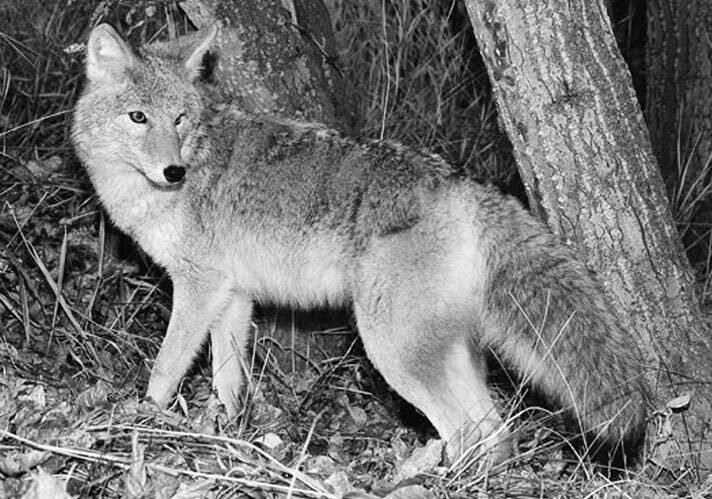 In March 2008, a coyote grabbed a dog from a back yard in the Yonge Street and Bloomington Road area of Aurora. The animal would have to show odd or aggressive behaviour before the Ministry of Natural Resources would consider removing or relocating the wild animal, Mr. Gates said. "Wave your arms and make yourself big to show dominance," he said. "Never turn your back as it is a sign of submission." You are advised to keep their distance from the animal, but if you find yourself in close proximity to one, slowly back away from the animal while making noise to let it know you are there. "The best we can do is educate the public," he said.